classes and from there, at 6 or 7, will move through the grade system up to and including professional level where appropriate. We work closely with the ISTD, which is recognised worldwide as one of the leading examining bodies for dance and its teachers are accredited by The Council for Dance Education and Training – all our teachers are highly qualified and experienced. It’s worth mentioning that the higher ISTD exams equate to point values with both GCSE and ‘A’ Levels and can be entered on UCAS forms as well as being part of the senior school Diploma in media specialisation. If your child is leaning towards a performing career, Ballet is one of the disciplines that they will be expected to have reached intermediate stage by the time they leave school. These classes are very popular and are great fun as well as improving co-ordination, flexibility, stamina and confidence. 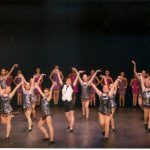 If your child is leaning towards a performing career, Jazz is one of the disciplines that they will be expected to have reached intermediate stage by the time they leave school. Exams are not compulsory and teachers will only enter pupils for exams after speaking to the parents and when they think the pupil is ready and has reached the highest standard that they can personally achieve. Tap has had a resurgence in popularity recently and classes are fun as well as very energetic! Tap helps children develop rhythm, co-ordination and improves fitness and stamina. If your child is leaning towards a performing career, Tap is one of the disciplines that they will be expected to have reached intermediate stage by the time they leave school. As with all the disciplines we teach, teachers will only enter pupils for exams after speaking to the parents and when they think the pupil is ready and has reached the highest standard that they can personally achieve.